It took me years to make a decent Cacio e Pepe, one of Rome’s traditional pasta dishes (the others are Carbonara, Matriciana, and Gricia). Since Cacio e Pepe has only three main ingredients -Pecorino Romano cheese, black pepper and pasta-, it might seem an easy recipe to make – but it isn’t. One of the things I learned from Italian cooks is that the most difficult recipes are the simply ones – the ones with less ingredients. For example, if you want to cook a superb Pasta al Pomodoro, you need to get high quality tomatoes –and choose the right type like San Marzano- , otherwise you will end up with a soggy sauce. Also, to get the right consistency, cooking time is crucial to let excess water evaporate from the sauce. In the meantime bring water to a boil in a tall pot. The level of water should not exceed ¾ of the pot’s height. Keep in mind that for 100 grs of pasta, you should use 10 grs of salt and 1 liter of water. When water boils, add salt. Consider that Pecorino Romano cheese is very salty, therefore, my advice is to add HALF of the amount of salt for cooking Cacio e Pepe. Add pasta and cook al dente. 1-2 minutes before pasta is cooked, place a serving bowl on top of the pot to heat it. This is a very important step in order to get a creamy sauce. Reserve some pasta water using a ladle. While you’re boiling spaghetti, the pasta releases starch into the water. Since starch is naturally sticky, it helps Pecorino Romano cheese fats to amalgamate well with both water and pasta. Drain pasta and transfer it to the heated serving bowl. Gradually add Pecorino Romano cheese and water tossing vigorously until you get a creamy consistency. If the sauce becomes too watery, add Pecorino Romano cheese; if it becomes too dry, add water. Season with lots of freshly ground black pepper and toss. Oftentimes the simple dishes are easiest to get wrong. One can notice a mistake far easier. A well-made dish of cacio e pepe is a thing of beauty and, Ambrosiana, you certainly did achieve that. The serving in your photo looks perfect! All that’s missing is its intoxicating aroma. Brava! HOLA GISITA, VOY A PROBAR ESTA RECETA Y TE AVISO!!! My father loves this dish and I never really understood it (probably becuase I didn’t know how to make it!). Now I can give it a go…your shots are beautiful. That is fantastic. I love the detail in your pasta recipes. I’ve always remembered the lessons that you taught me here. The first picture is really cool. Nice one. Lovely photos of such a simple but delicious pasta dish. Brings back wonderful memories of our trip to Rome! holy delicious cow, batman! that looks amazing! i love pasta of all types so this looks right up my alley. This is absolutely gorgeous! I can’t wait to make this. It just looks like pasta heaven. this looks amazing! I agree, the less ingredients, the more difficult to make perfect. I think I will give it a try though! This is a fantastic dish a must have at Roma Sparita in Trastevere/Roma, mentioned to our friends, DO NOT MISS THIS. Just made this, per instructions. Sooo delicious!! I was eating it out of the bowl before it reached the table! Also, just a note: I reserved quite a bit of the pasta water, and was glad I did, since it took more liquid than I expected. I was not able to achieve a sauce — I made half the recipe and reserved about 3/4 cup of pasta water — any suggestions? Maybe I should have reserved more water? Possibly, did I add the cheese too fast? It seemed the cheese was clumping rather than melting. Many thanks for any suggestions. Hi! First of all make you got good quality Pecorino Romano cheese. Also reserve enough pasta water (2 cups at least) to make sure you have enough for tossing pasta. Be sure to heat your mixing bowl, and that water is still hot. Don’t wait too long before spaghetti cools down. First add cheese and then pasta water, toss vigorously until you get a creamy consistency. Add more cheese if it is too watery; add pasta if it is too dry. Hope this helps! Most of the of best places I had this in roma it was not this creamy, it was always pilled on fresh grated. This seems more like american melted mac and cheese. Nothing wrong with this, I dont want to be recipe police, but people shouldn’t worry about getting it this melted with adding water. If you use really fresh good pasta which is so important on this recipe it wont be dry, and if you get fresh cut pecorino, its not that dry either. I would assume that if you use dried out pecorino or dried pasta you might need to add water to make it creamier. I like your response, and more than that your blog. Using a bit of starchy water to help with adhesion is a great tip which makes a huge difference in most all of the pasta dishes i make. It is only after I learned this method that I felt confident in my ability to make a great pasta. It is unfortunate that most people are not aware of this (including myself up until a few years ago). this looks perfect! Just like the ones I had in Rome! They were all so creamy but I knew they must not have cream in them so I’ve been trying to find just the right recipe and this looks to be it. Thanks! Also, one of the trattorias we ate at added in a bit of pink peppercorns and it added a whole new layer to the dish, worth a try sometime! HI – thanks for the recipe! One question: why heat up a serving bowl as opposed to using the pot we boil the water in? It will remain hot, won’t it? Or is there something I’m missing? Hello!! I am glad you gave it a try and it turned out well.! Thank you!!!!!!!! Why is there milk in the ingredients but not in the recipe? I have had Cacio e pepe over all sorts of pasta in Italy and it is one of my favourite pasta dishes. Like you said, it is difficult to make it well. I certainly have to train a bit more before I blog about it. I will certainly follow your precious advice and try this again soon! Hello! As I said at the beginning of my post, it takes time to perfect the dish. You have to try different pasta formats and brands (I personally use pasta di Gragnano’s Spaghetti alla chitarra) before you get it right.I also try to find the best Pecorino Romano I can get. As far as water quantity it all depends on the quality of cheese and pasta. Once you find the pasta and Pecorino Romano type that works best for you, try to be consistent and always use these when you make Cacio e Pepe! I tried making this last night with good aged pecorino and found that following your instructions made the pasta much too hot and the first half of the cheese clumped! 😦 My husband said to wait a bit to add the second half and to remove the clumps, so I did and tossed with two forks and it achieved that real good creaminess. I would not heat the bowl next time and I would wait a moment after adding in the hot pasta water to the hot pasta to add the fresh grated cheese to mix. Even with half the cheese it was still delicious and creamy. The recipe sounds convincing. Thank you, I will definitely try it! Only one remaining question: caccio ricotta or pecorino romano? Thanks for this recipe, works well. Make sure to use the smallest possible holes on the grater, it allows for faster melting and emulsification. Make sure your serving bowls are warm! I just made this recipe. It was delicious. I used the pot that I’d used to cook the spaghetti so perhaps it was too hot as the cheese did clump. I added the hot pasta water and some of the sauce was creamy but it still had cheese clumps. Think I need more practice! Cacio e pepe needs practice. The more you do it the more you’ll master the technique! Thanks for visiting! My husband made this dish, it was the best ever! Great recipe!! this is amazing thank you!! if you add bay scallops its even better! Yummy! Baby scallops sound great! Thanks for visiting! I am able to get the sauce somewhat creamy but I also find that I get some big clumps of cheese. How can I avoid this? Hi. It all depends on the quality of cheese you use (Pecorini Romano cheese). If you do not get the creamy consistency, try mixing the cheese with the hot pasta water in a blender (immersion blenders are the best) to get a smooth sauce. Add more water if your sauce is too thick, or add more cheese if it is way too runny, until you get the desired consistency. Hope this help! I just discovered this recipe on Pinterest and when I looked at the pic I thought “oh its a cream base but it looks so good” (I normally don’t eat cream base dishes). Lo and behold I open the recipe site – no cream! I just made this and it is fabulously good! So simple, yet so superior to any cream sauce out there (imho). I have a soft spot for pecorino and this showcased the cheese wonderfully! Thank you for posting this recipe! This is the recipe I use. This is the PROPER recipe. I cannot believe the recipes I see online-Saveur, Bon Appetit, Epicurious, and Mario Batali, for Crissake, all use cream, or butter, or oil. The Romans that I know and love (including members of my family), would blanch at using any other recipe. It’s the same with Fettucine Alfredo. Four ingredients. No cream. Look at the crap we get in restaurants. Good work. I feel delighted you liked it! And thanks for the compliment of Proper recipe! Hello! thanks for reading and visiting my blog. I understand if you cannot get it quite right. it takes time and a lot of practice. The water/ cheese ratio much depends on how creamy you want your sauce. If you have difficulties in getting it right, I suggest (I usually do it myself) to combine in a saucepan 1/2 cup of grated Pecorino Romano and 1-2 tablespoons of pasta water, then use an immersion blender to combine the ingredients; add more cheese if the sauce is too runny, or more water if it is too thick. As regards to aging of cheese, I use Brunelli (http://www.brunelli.it/pecorino-romano-dop), which is aged for at least 12 months. Hope this helps. Please do not hesitate to contact me should you need further advice. Kindest regards. Extremely disappointing – twice now. Lumpy, elastic, watery and a horrible waste. Just google ‘cacio e pepe without butter’ and you’ll find better recipes and explanations. I am so sorry it did not turned out as well as you expected. 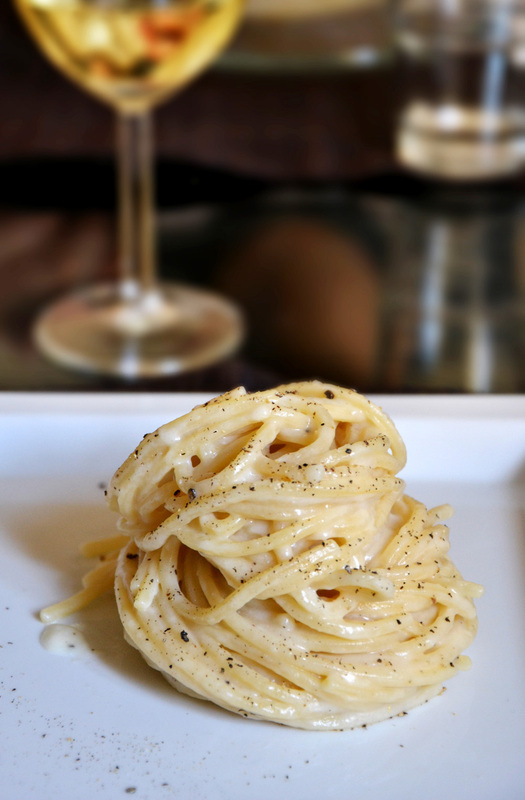 Hope you find the Cacio e Pepe recipe that best suits your needs and cooking skills. 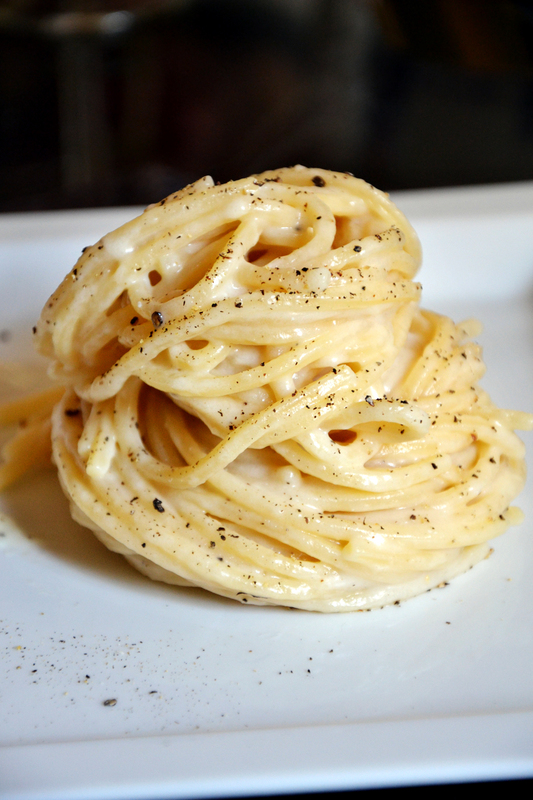 The web is full of Cacio e Pepe recipes and I am pretty sure you’ll find the right one for you. Kindest regards. Dear Ambrosia, thank you for this great recipe. Minimalistic and essential in its ingredients and handling, as Italian cooking should be. Distilled to basics thru centuries of practice. Last time we were in Rome, we had this great pasta dish at Fortunato all Pantheon. They use a large diameter spaghettone, which is good for collecting the sauce, but heavy. I used Bucatini, which are large section but light. Add as little pasta water as possible to the cheese sauce and salt generously. I tried it last week in a restaurant whilst in Rome and I cooked it this evening with special Pecorino cheese bought in Rome. I followed the recipe and it was delicious. Thank you. Finally a recipe that works! I’m so happy with this. Tried it out tonight and really got that fine creamy texture. Now I just have to work out the water and cheese balance to for the saltiness. Cacio e pepe is one of my favourite pasta dishes. I tried to make it for years at home, but could never really match the original Roman taste. Even though my mom is Italian and a great great cook, she’s from Tuscany and could not help me improve the recipe. Great job. Thank you for this delicious recipe. I had only one issue. My noodles tend to form knots. I made the spaguetthi myself like always (fresh homemade). There are a little bit more fragile than normal one and I was afraid to get them smashed or broken. Any advice to get a beautiful finish as you does? Thank you! I cooked this recipe tonight and it was spot on! I’ve been meaning to cook this dish ever since my husband and I had it in Rome last year. Thanks so much! Such simple ingredients yet so delicious! I am happy to hear that! Super!! Thank you!! east coast in the US and have tried pecorino locatelli from the supermarket which was way too salty… i think it is used in the states as a topping rather than as a main ingredient. i tried another (antica i think) which was too mild. pecorino ginepro finally worked best. is there a particular type you use? i suspect that the cheese they import to the states might be different than what is available in Europe. Hello. I imagine it is very hard to find a good Pecorino cheese, but don’t worry. If you find it harda to mix all ingredients and get a creamy sauce using the method I explained in my post, try to mix it all up using an immersion blender. Please let me know if this works out for you. Ciao! Loved the recipe. Turned out JUST AS good as I had in Rome, no joke. Thanks a ton! Hi there! Thanks for posting this great recipe. I’ve made it twice already, and like many others, I’m not able to get a creamy sauce without clumps. I have followed your recipe exactly: I’m using high quality pecorino Romano, am heating the serving bowl, and am not letting the pasta or water get cool. When I add the cheese to the hot pasta, it doesn’t melt; most of it just clumps up like mozzarella. The method you describe to make the sauce separately using an immersion blender doesn’t seem to make sense. Could you clarify? Hello there. Using an immersion blender to mix Pecorino cheese, pasta cooking water and pepper is an alternative method to combine the ingredients that otherwise would be blended direclty into the pasta. When you pour pecorino cheese and water into a bendling cup and use an immersion blender, you get a creamy sauce that you mix it with your pasta. I hope this clarifies your doubts. Excellent…… Thank You for the tip on the bowl over the heat to get a creamy sauce…..
Da Enzo in Trastavere has the best cacio e Pepe. They make theirs by mixing ice cold water with pecorino Romano in a metal bowl with the pepper. Then add the pasta to the bowl tossing quickly and adding some pasta water as needed. It comes out beautifully creamy. Totally delightful. They also use Sarawak pepper. I love their recipe. Worthy of the Week | Oh hey, what's up? Rachel Bowie October Page: A toast! The Rachel Papers October Page: A toast!